Today, some words of wisdom from wonderful writer and former U.S. Marine Phil Klay, author of the acclaimed new short story collection Redeployment. 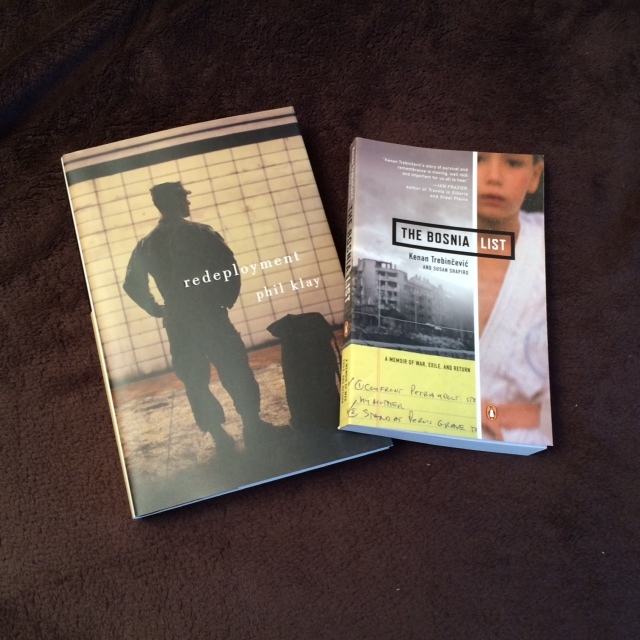 Redeployment powerfully encompasses multiple perspectives and experiences of war. The collection recently received a fabulous review (an engaging read in itself, while informative about the qualities that recommend the review’s subject), by Dexter Filkins, author of The Forever War, in the New York Times Book Review. In April, The Center for Fiction, in midtown Manhattan, near Grand Central, hosts Phil Klay on Redeployment and Jennifer Vanderbes, whose new book The Secret of Raven Point, is about a brother and sister, soldier and nurse, stationed in Europe during World War II. That’s April 10th at 7:00 p.m. in NYC. War literature is also coming up at Franklin Park’s Reading Series. You can catch Jennifer Percy, author of Demon Camp, about a returning Afghanistan veteran, along with Kenan Trebincevic and Susan Shapiro, writing about Trebincevic’s experiences as a Bosnian émigré and his trip back after the war in The Bosnia List, plus Liza Monroy, author of The Marriage Act, and essayist Melynda Fuller. That’s this coming Monday, March 24th at 8:00pm – Franklin Park Bar and Beer Garden. Voices from War’s Writing Workshop for Veterans – Winter-Spring 2014 is running now. Stay tuned for summer options. Next Class (#6 of Season 2): March 23rd.